* What am I writing? * Why am I writing it? * What effect do I want to create? first evoke it in yourself. * How do I intend to create this effect? Writing can be a lot like acting, like story performance on stage. When I teach storytelling, this is almost the same thing I tell my students–good to recall that I need it too–It’s important in life to always be a student. OK, I do know it is Thursday and I do not have a good excuse for not blogging yesterday so….. 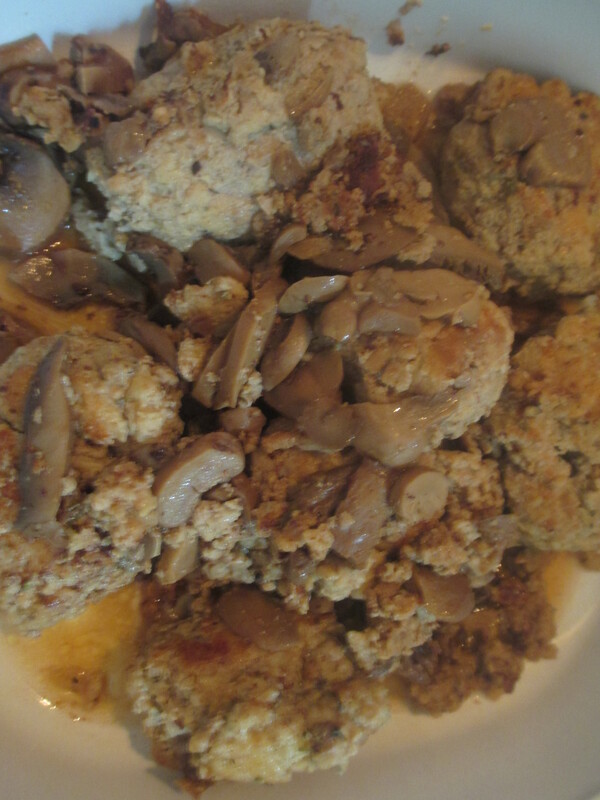 But I will make it up to you by sharing my Veal Marsala Meatball recipe with you. Spoiler alert: Two ingredients are essential but may be hard for you to acquire–Florio Marsala and Kudzu Bakery Pepper Bread. You can work around the pepper bread (I’ll tell you how in the recipe) if you have to , and if you can’t buy the Florio brand of Marsala where you live, then buy the very best you can find. It makes a difference. Mix all ingredients from veal through salt. Form into balls. Fry in olive oil until golden brown. Transfer to plate with paper towel. Add butter to same pan, sauté mushrooms, add Marsala and a bit of flour to make it more of a sauce. Put the meatballs back in the pan to heat with the mushrooms. Serve. I like to serve it with saffron-flavored rice. Serves 4 . I used it to serve two and then froze the other half of the recipe and served it reheated. The photo is of the reheated dinner serving which tasted as good as the first time I made it. The contrast of the pepper and the sweet wine is delightful! I am also going to try this recipe with ground chicken–will let you know how it comes out. When I looked back at my posts, I realized I completely skipped Friday. It was on my to do list, but it did not get done. Sorry, fans and followers that I missed out sharing with you how to increase your productivity in writing or story performance. I was busy at work on a review of a book that has relevance. –Why tell you about it today on parenting share day? Because when we have an oops, it is important to share that with our children too. They need to hear about failures and how we got over it, made up for it, did better after. Life is not a series of successes and if they see our lives like that , how will they come to us and ask for help when they experience the inevitable failures life brings? Be truthful and honest in your sharing with your children. Help them grow tall in their inner selves. A small but delicious blessing to day–I went to Kudzu Bakery in Myrtle Beach to pick up the free lunch I won on their FB page. After studying the list of luscious sounding sandwiches and eyeing the cheese and other delightful options, I finally made up my mind. 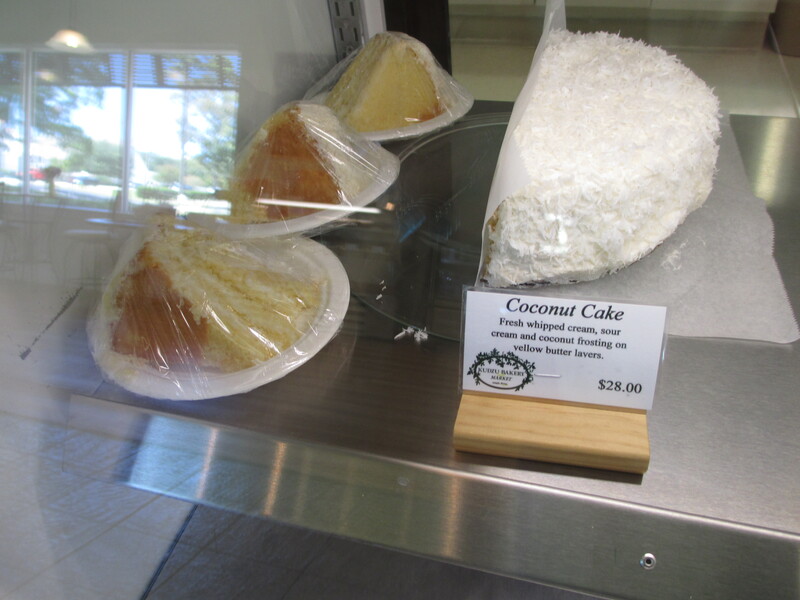 I would have dessert for lunch and I asked if I could have a slice of their fantastic looking coconut cake, a Southern staple. They graciously allowed my choice–health for the soul over healthy lunch today. But once you get a look at the photo you will know why! Just read on a friend’s post that her daughter is ill. I was ill yesterday and in fact most of August. My friend is caring for her little girl with special foods/drinks to keep her hydrated and lots of love. My Mom would do the same–and my Dad. How you care for little ones when they are ill, is a great trust builder in families. It says that even when you aren’t tip top, you are still loved and valued. Hugs all round. Yesterday I read a newsletter article about listmaking. I practically gave my self the old cuddahaddav-8 headslap! Of course! I make lists for groceries,. I used to make lists all the time–just because I don’t do as many projects as I used to, I do still need a list to keep me on task. Oh, I’m not missing deadlines, but I am letting good projects languish because I get distracted. I meet word per day counts on my book, but not on the several short stories I’ve begun and not finished. So, back to the handwritten list. writing by hand helps seal it into my memory. I can take the notebook with me wherever I go. I can see a history of what I have done. So, back tot he hand made list. Maybe if I had made a list I would not have missed my Wednesday blog! A list is not just an organizing tool–it’s a boost to hard work and a dream maker’s basket of possibilities. Dream on–and what I don’t finish today will go on tomorrow’s list!